Secondary School no. 1 celebrated its 80th anniversary this year. 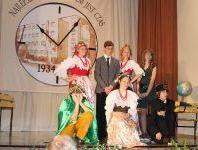 The anniversary was an opportunity to organize a number of events: Pupils’ Day (September 24th), Visitors’ Day (September 25th) and Graduate Day (September 26th) for all who graduated from Secondary School no. 1 (former Primary School no. 1). The Visitors’ Day was celebrated by retired directors, teachers and administrative employees. Jan Bochenek, the Deputy Director representing the local office of the Board of Education in Rybnik, town authorities represented by Marek Balcer, the Mayor of Mikołów and Adam Zawiszowski, Deputy Mayor, as well as Tadeusz Socha, Chairman of the Town Council and Anna Kubik, his Deputy participated in the events. Representatives of Mikołów County, other schools, parents and classes delegations were also present. During the celebration, Mrs. Grażyna Nazar, the school director, went back to the school’s history, both the beginning i.e. year 1934, the years after the WW2 when it used to be a Primary School, and the last 15 years of the school’s functioning. The anniversary could not do without a birthday cake and some personal memories as many guests were the school’s graduates.